Mote con Huesillo roughly translates to peaches with wheat. 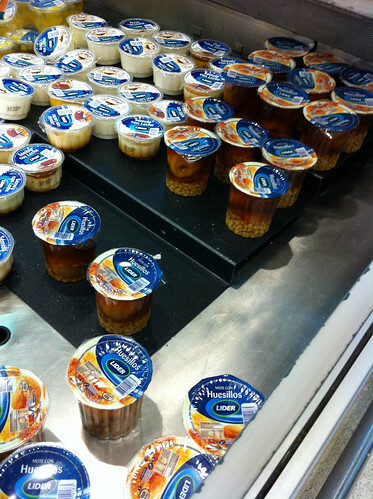 When you think of that combination, you might be tempted to turn away. However, this isn’t a pile of chewy ingredients. This is a drink made from husked wheat (mote), and dried peaches (huesillo) soaked in sugar water to make a sweet and flavorful combination. In essence, it is a drink you can eat but it doesn’t melt like a milkshake. Wash and soak the dried peaches (huesillos) overnight to rehydrate. Cook the rehydrated huesillos in sugar water with some cinnamon for 30 minutes. Cook the husked wheat (mote) until tender, then drain. Add the cooked mote to the sweet huesillo liquid and then put it in the refrigerator. This drink is served chilled. 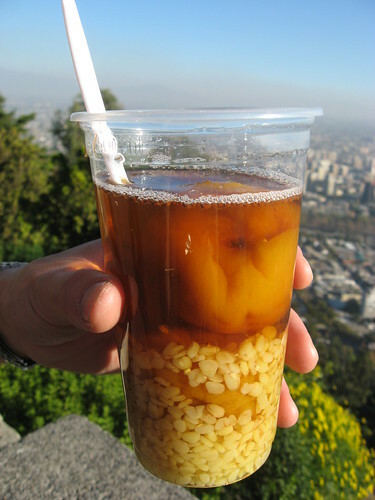 If ever there was a drink that symbolized Chilean summers it would be mote con huesillo. You’ll find Mote con huesillo for sale from various street vendors that you’ll see as you travel around. If you are staying with friends or family, ask if they have a good family recipe they can share or a favorite place to buy the drink. Be sure you get a spoon to “drink” your mote con huesillo or it might be a hard time getting it down. Also keep in mind that depending on who makes your drink, the dried peaches might still have the pit in them. Careful how you chew! This was my most favourite drink in Chile but it is really filling. If you are small like me treat it like a meal! @Anne – it definitely is filling. It is more like a food than a drink. OMG…I can taste this Mote con Huesillo right now! It is the most delicious drink ever!! I agree with Anne, it is very filling. It is awesome served more so as a midday snack of to replace a meal. We had a few days in Santiago/Chile about 2 weeks ago. Walked around downtown Santiago and saw this drink that looked similar to the drink in some Asian countries and popular among the locals. I must try it. Wow!! it’s beau……tiful. It’s so refreshing and delicious that we had to go back to the same vendor to have another one. @Kalaya – it definitely is refreshing, particularly on a hot summer day. Summer 2013: going price for “chico” sized mote con huesillo in Santiago street stands is $400. It was OK–not amazing. Glad I tried one though.